Information quoted from the US Secret Service Web Site. An individual or company receives a letter or fax from an alleged "official" representing a foreign government or agency. An offer is made to transfer millions of dollars in "over invoiced contract" funds into your personal bank account. You receive numerous documents with official looking stamps, seals and logo testifying to the authenticity of the proposal. Eventually you must provide up-front or advance fees for various taxes, attorney fees, transaction fees or bribes. Other forms of 4-1-9 schemes include: c.o.d. of goods or services, real estate ventures, purchases of crude oil at reduced prices, beneficiary of a will, recipient of an award and paper currency conversion. Unfortunately, there is a perception that no one is prone to enter into such an obviously suspicious relationship. However, a large number of victims are enticed into believing they have been singled out from the masses to share in multi-million dollar windfall profits for doing absolutely nothing. It is also a misconception that the victim's bank account is requested so the culprit can plunder it -- this is not the primary reason for the account request -- merely a signal they have hooked another victim. In almost every case there is a sense of urgency. The victim is enticed to travel to Nigeria or a border country. There are many forged official looking documents. Any number of Nigerian fees are requested for processing the transaction with each fee purported to be the last required. The confidential nature of the transaction is emphasized. There are usually claims of strong ties to Nigerian officials. A Nigerian residing in the U.S., London or other foreign venue may claim to be a clearing house bank for the Central Bank of Nigeria. The criminals obtain the names of potential victims from a variety of sources including trade journals, professional directories, newspapers, and commercial libraries. They do not target a single company, but rather send out mailings en masse. The sender declares that he is a senior civil servant in one of the Nigerian Ministries, usually the Nigerian National Petroleum Corporation (NNPC). The letters refer to investigations of previous contracts awarded by prior regimes alleging that many contracts were over invoiced. Rather than return the money to the government, they desire to transfer the money to a foreign account. The sums to be transferred average between $10,000,000 to $60,000,000 and the recipient is usually offered a commission up to 30 percent for assisting in the transfer. The goal of the criminal is to delude the target into thinking that he is being drawn into a very lucrative, albeit questionable, arrangement. The intended victim must be reassured and confident of the potential success of the deal. He will become the primary supporter of the scheme and willingly contribute a large amount of money when the deal is threatened. The term "when" is used because the con-within-the-con is the scheme will be threatened in order to persuade the victim to provide a large sum of money to save the venture. The letter, while appearing transparent and even ridiculous to most, unfortunately is growing in its effectiveness. It sets the stage and is the opening round of a two-layered scheme or scheme within a scheme. The fraudster will eventually reach someone who, while sceptical, desperately wants the deal to be genuine. Victims are almost always requested to travel to Nigeria or a border country to complete a transaction. Individuals are often told that a visa will not be necessary to enter the country. The Nigerian con artists may then bribe airport officials to pass the victims through Immigration and Customs. Because it is a serious offence in Nigeria to enter without a valid visa, the victim's illegal entry may be used by the fraudsters as leverage to coerce the victims into releasing funds. Violence and threats of physical harm may be employed to further pressure victims. 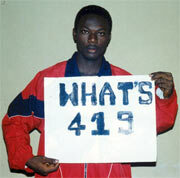 In June of 1995, an American was murdered in Lagos, Nigeria, while pursuing a 4-1-9 scam, and numerous other foreign nationals have been reported as missing. Victims are often convinced of the authenticity of Advance Fee Fraud schemes by the forged or false documents bearing apparently official Nigerian government letterhead, seals, as well as false letters of credit, payment schedules and bank drafts. The fraudster may establish the credibility of his contacts, and thereby his influence, by arranging a meeting between the victim and "government officials" in real or fake government offices. In the next stage some alleged problem concerning the "inside man" will suddenly arise. An official will demand an up-front bribe or an unforeseen tax or fee to the Nigerian government will have to be paid before the money can be transferred. These can include licensing fees, registration fees, and various forms of taxes and attorney fees. Normally each fee paid is described as the very last fee required. Invariably, oversights and errors in the deal are discovered by the Nigerians, necessitating additional payments and allowing the scheme to be stretched out over many months. Several reasons have been submitted why Nigerian Advance Fee Fraud has undergone a dramatic increase in recent years. The explanations are as diverse as the types of schemes. The Nigerian Government blames the growing problem on mass unemployment, extended family systems, a get rich quick syndrome, and, especially, the greed of foreigners.